Do You need an eBay Shop when Starting Out? If you have an established eBay business you’ll most likely already have an eBay shop subscription too, due to the various advantages it presents. But what to do if you’re just starting out on eBay and have sourced only a few products to sell? Do you need to sign-up for an eBay shop or can you do just fine without it? I’ll try to answer this question in detail in today’s blog post. First of all – what are the advantages of having an eBay shop subscription? Ability to use the Good ‘Til Cancelled (GTC) listing format. In my opinion this is the most important advantage of an eBay shop! If you want to rank your listings high in eBay’s search results in competitive niches, you simply MUST use the GTC listing format and follow my guide on how to get your eBay listings ranked in the top search positions. Without GTC listings you simply won’t be able to compete with sellers who use them and build huge sales history over several months and even years. Savings in listing insertion fees. I already covered fees in my recent eBay fees blog post so I won’t go into too much detail about it again now, but just so you know – with a shop subscription you get a certain number of free listings each month. Exactly how many depends on which subscription you choose but at a certain level in your business, this can provide a decent amount of savings in the amount of fees you pay. 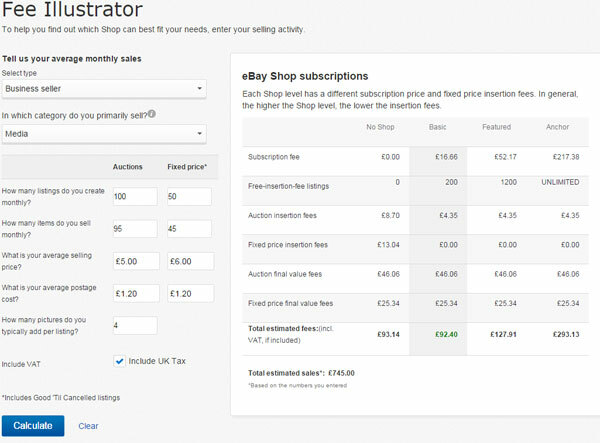 There’s a very handy fees calculator on eBay which you can use to see exactly when it makes sense for you to move over to a shop subscription and which one is best for your business. This is VERY important in niches where you sell various related products and where people generally order multiple products in one go. For example, if you sell wedding favours, craft supplies, sports supplements and other such similar products. People who search for a specific product in niches like these are most likely interested in other products you sell and, with the Add To Cart function, it’s now easier than ever to order multiple items in one go on eBay. When you have an eBay shop, the name and a link to your shop will be displayed on each product listing page and this greatly increases the chance of people looking at some of your other items and adding them to their order. Sure, without a shop there is still the option to “view other items from this seller” but that is nowhere near as effective. 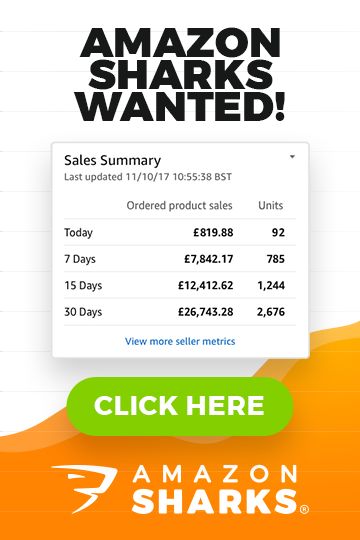 Following on from the previous point – if you sell hundreds of products, it really helps to organise them in to product categories as otherwise it’s really difficult for people to find specific products. When you have an eBay shop, you can create these product categories and sort your products as you like. Ability to use custom pages. Maybe not that important but still – when you sign up for a Shop, you can create 5 custom pages where you can publish tutorials, about us information, contacts, extended warranty information etc. and have it all within your shop, easy to link to from listings. This is very important with technical items where you don’t want to include installation/set-up instructions directly in your listings (that would make them way too long) and need a few separate pages on eBay to publish this information. You can upload a logo, set the colour scheme of your eBay shop or even get a custom design done. Plus you can have banners on the shop homepage featuring sales, most popular items and so on. 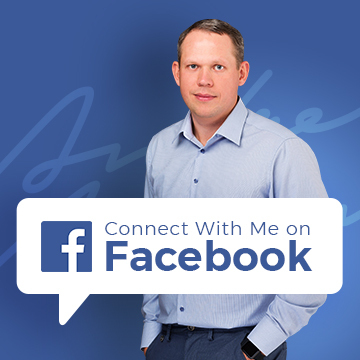 This is another great way to increase your chances of selling more than one product to the same customer. As you can see, having an eBay shop really helps your business in various ways and as it costs just £20 power month for the basic shop, I highly recommend you sign-up for an eBay shop from day one! Yes, even if you sell just a few products, you’ll be better off with a shop subscription than without it. To be honest it’s well worth the subscription fee just to be able to use GTC listings, never mind all the other benefits! If you sell single items only. For example if you work with arts items, rare items and similar products, where you only have ONE UNIT of each item, you could do ok without the shop subscription as you won’t need the GTC listing format and most likely people who search for such items won’t be that interested in buying more from you (but that’s just a generalisation and it really does depend on the niche). This would also apply to the used goods concept where you’ll mainly be selling individual items so will just use an auction or BIN listing, not a GTC. If you sell in niches with very little competition. If there are only a few competitors selling the same product as you, you can still reach the top of search results, regardless of whether you use GTC listings or not. Such situations are very rare though as for nearly all niches on eBay, there will be at least a few pages of search results. If your budget is super low. If you’re just starting out on eBay and your budget is say £50 – £100, obviously it wouldn’t be wise to invest £20 a month just for a shop subscription as you won’t earn that fee back from the benefits you gain. With such low budgets, you’re really just better off investing everything into products to resell. Then once you increase your budget to at least a few hundred pounds you can then sign up for the shop. So these are the three main exceptions when you don’t necessarily need an eBay shop subscription. Having said that, even if you do only sell individual items or work in a niche with very little competition, you would still gain an advantage by having a shop subscription – cross-selling, up-selling, more customised design options etc.! So unless you’re starting out with a very limited budget, I would still suggest looking into getting a shop subscription (Basic should be fine) from day one. If you have any questions or need advice on this topic, please leave your comments below this post and I’ll personally answer every one of them. What does the GTC format mean? It doesn’t explain further. GTC stands for – Good Til Cancelled. Dear Andrew …this is a serious question….do you work for eBay? Have never worked for them and never will! Is a shop still a good idea when Ebay seem to be offering speacial deals of 100 free listing per day for Private sellers ? Yes, it is. First of all, only Business sellers can qualify for Top Rated Seller status so it does not make sense to stay as private seller for very long. Secondly, only shop owners can use Promoted Listings feature. For these two reasons alone, if you’re serious about your eBay business, you will want to upgrade to Business seller and get shop subscription too. Thank you for all this information and advice. Just a quick question, you say you recommend opening a shop straight away. What about for new eBayer’s and their selling limits? So where you only get to list 100 items per month as a new eBayer with it rising each month if you do well, with a shop subscription do you get given extra listings? No, shop subscription does not affect/help with your selling limits. Would I need to sing up for an Ebay Shop for a certain amount of time or is it month to month. It’s on a monthly billing cycle so you can cancel whenever you want. How To Rebrand Your eBay Shop for FREE!